For those who have read my novel “Peak” this is a very interesting email. Stranger than fiction… Thanks for letting me share this, Jenny. And good luck on your trek. I’ve never written to an author before but I wanted to tell you how your novel “Peak” came to our family. Early last year, my 15 year old son Josh was arrested after scaling (free climbing) to the top of our local lighthouse. From what I can tell, the police took him for a “jumper” and were well and truly pissed off to learn, after they’d come rushing from all directions, that he was just doing a recreational climb. They laid tresspass charges against him that luckily we were able to later talk the sergeant into dropping. And there’s another bit that I have yet to mention…. Josh’s father and I are now separated but we originally met 20 years ago high in the Himalayas while trekking in Nepal, him from Scotland and me from Australia. Unlike Peak’s parents, I have never been a climber but trekking in Nepal has been a huge part of my life. Anyhow, about 2 weeks after the climbing incident, I came across Peak in our local library and passed it on to Josh thinking he might enjoy reading it. Thank you for your delightful story that resonates so closely to with family’s story (I find it a bit freaky really!) and thank you for helping to get my son to the point where he is wanting to explore the Himalayas I love so much. Roland, I really appreciate you pubishing my story, it’s such a fantastic thing you do writing this blog and showing some respect to the people who are supporting you. I found it fascinating reading Peak, as it was so strangely similar to my own life (well, I haven’t climbed Sagarmāthā yet). I’ve continued free climbing and parkour, and I’m currently training 3 times a week in the city (3:08 http://www.youtube.com/watch?v=SdYhQgy2bsU) as well as indoors once a week for gymnastics. I’m hoping to step this up and start climbing witha few friends of mine sometime next year (after I convince mum, that is). Once again, I really appreciate you publishing my story, it was great to be inspired in such a personal way. My pleasure, Josh. Climb safe. We are a fifth grade class from the northwest suburbs of Chicago. We just finished reading Peak today and loved it! We have been exploring your website and blog and watching some video trailers of other books you have written. Many of us are excited to read some more of your novels soon! We would so greatly enjoy if Peak turned into a real movie some day. We would love to read a sequel to Peak or another book in the Cryptid Hunters series. If you have some time, could you please send us some writing tips? We have been very busy writing our own stories and would love to have some help from a published author. Thank you for your time and Merry Christmas! I’m going to begin reading Peak with my 8th grade students. Is the Blue Mountain symbol Peak uses a nod to Tennessee Williams? It is not, although I am a big fan of TW. Peak has been optioned for film many times. Perhaps one day someone will turn it into a movie. I write about things that are interesting to me. It takes me twice as long to research a book than it does to write it. I get my ideas for the story from the research I do. It takes about a year to write a book (minus the research) this is where all of the action and excitement comes from. I go over and over the story for months building the action and excitement by revising the story. I am James from Florida and I am currently doing a research project on Peak. Please take the time to review and answer my required questions below. 1. Where there any struggles in the plot when you wrote the book? 2. Did you base your book Peak on the experiences of Jordan Romero and do you know him personally? 3. Was the Peak experience based on any one travel company or a combination of several companies? I appreciate your time and any assistance that you can provide. No more plot struggles than normal. I know Jordan ‘virtually.’ We did a Skype program together at a school. Peak pre-dates Jordan’s climbs by many years. It came out in 2007. 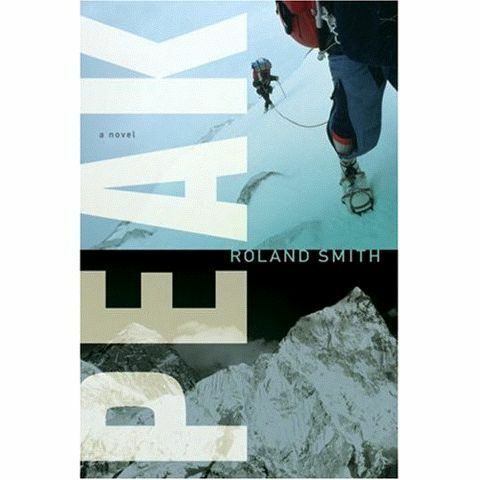 Dear Roland Smith, In my Language Arts class we have been reading your novel, ‘Peak’. I really love the book and I have a few questions about it and your writing, If you don’t mind. Where did you get the ideas for the characters in ‘Peak’. Whats your favorite topic(s) to write about? 1. Out of all the books you have wrote, which is your favorite? 2. What inspired you to write Peak? 3. Have you ever related your characters in any of your books to people you know in real life? 4. If you had a chance to change anything in any of your books, would you? 5. And if you would change anything, what book and why? Hello Mr. Smith, I’m sure you don’t remember me but we met when you went to that college in Owasso, Oklahoma to talk to those 5th graders about your life story and how you became a author. I was one of those 5th grader but I am now a 7th grader. I am Nevaeh. I am writing a story of my own right now and I could really use some advice from a great author. I am not saying you have to read what I have wrote so far I just have some questions. please email me. Thank you! Hi Nevaeh, thank you for writing. When I was at your school I told you almost everything I know about the writing process. It’s really very simple… Read everyday. Write everyday. Writing is not necessarily hard, but like everything in life, it takes a lot of practice to become good at it. It sounds like you are well on your way. Keep it up. I read all three Storm Runners books and enjoyed them very much. I was wondering if there will be another book and if so when it will come out. Hi Cianna. I’m afraid that the Storm Runner series is complete. Did you write Peak because you were inspired by a climber? How did you choose the names of the characters? Which chapter did you have most fun writing? How long did it take to finish writing Peak? When you finished were you exausted or started right away planning on the next book? How did you choose the names of the characters? A few of the characters are named after people I know. The others? I choose names that I like and that do not sound like the other characters in the book. How long did it take to finish writing Peak? With the research, 2 years. When you finished were you exausted or started right away planning on the next book? I always start a new book the day after I finish a book. I hope you get a chance to read the sequels: THE EDGE and ASCENT. I’m working on the final book right now. DESCENT. It will be out this time next year. Do you know Terry Trueman, author of Stuck in Neutral? The reason why I’m asking is because of course, Terry Trueman was a character in Beneath, but I also saw that name elsewhere. I was recently reading Resistance by Jennifer A. Nielsen, when I looked at the back and found a quote from Terry Trueman. I just wanted to know if that was somehow done on purpose, because I was reading some other reviews and found Josh, the name of Peak’s dad. He said thanks for publishing his story. Therefor, I was just wondering if you also knew Terry and if you named the homeless banker after him. Ha! You have a sharp eye. Yes, Terry Trueman is a good friend and I did make him a homeless banker in BENEATH. I am in year 7 at ACGS (Anglican Church Grammar School) in Brisbane, Queensland i believe one of my class mates Clancy emailed you prior and i was looking to ask you just one question. Clancy and i have started reading “The Edge” and i was wondering if you would make a third book in the series ? ? ? The third book in the PEAK series came out this year. It is called ASCENT.